The national debt has finally reached the point of abject irresponsibility. The unpaid debt accumulated in the past decade exceeds that accrued over the 220 years between the Constitutional Convention and 2007. According to the U.S.Treasury <link> the total recorded debt on September 30, 2007 was $9,007,653,372,262. Each citizen now owes approximately $61,900 to the country in addition to any personal debt. Each taxpayer has an individual obligation to the federal government in the amount of $168,000 (that is after normal taxes are removed from your income, interest and dividends). Eh, a few billion here, a few billion there…What difference, at this point, does it make? When an individual decides to accept debt in exchange for satisfaction of their needs or wants, he or she must generally provide collateral to the lender. That collateral might be in the form of a mortgage on their home or other real estate or a provision allowing the lender to access a portion of their income commensurate to not-less-than the amount of regular interest on that loan. Most frequently, the terms include the interest plus the termed pro-rata repayment of principal. In either or any case, the lender wants an assurance that the loan will be repaid. No such requirement is made of governments. When an individual or entity such as a company or corporation defaults on their debt, the courts may act on a declaration of bankruptcy and remove a portion or all of the existing debt. However, the borrower is obligated to offset as much of the debt as possible by liquidating physical assets and providing the proceeds to the court. That individual or entity must then resume life without. He, she or it must start from nothing with only a possible ongoing subsistence income to survive. Friends and family may choose to help out for a time, but eventually the particular debtor must assume the burden for their lives, livelihoods and actions. If and when a federal government defaults on massive outstanding debt, their recourse is to take as much as necessary from the citizens therein to cover the obligation. That might mean converting our businesses, our real and personal property as well as our income and savings to cover the obligations made by our elected officials. We, as a citizens and taxpayers, have no choice at that point. We had choices when we elected our presidents and representatives over time. We had the choice to re-elect or reject them. We allowed them to fritter the tax money we worked to earn. They did so in often irresponsible ways and against our wishes and principles. We allowed it. We created this problem. At the point of default, we have only us to blame. That, my friends, is how Communism comes about. Once the government controls the economic infrastructure of a country, the citizens become chattel. Once the government has complete control over our lives and livelihoods, it is a long and tough fight to regain what we now have and complain about. It is time to make some major changes. There is no longer a defining line between conservatives and liberals when it comes to government spending…it is all liberal spending. The line must be redrawn by making a rapid and colossal change to the failing congress and their process. It is okay to have two (or more) parties with differing viewpoints offering input to policies and procedures for the nation. However they both, or all, must be reasonable and responsible for the decisions on which they arrive. There must be a cost/benefit analysis done, not just a cost analysis. The Congress must explore and debate the potential consequences of the laws and conclusions as well as the perceived benefits without indicting the opposition or depicting them as evil or insane. But we must accept the responsibility to elect sane and reasonable people to represent us. Good luck handling your portion of the debt. *BTW, the median household income according to the New York Times on September 12, 2017 <link> is currently $59,039. Just because a congressional candidate has a (D), (R), (L) or (I) behind his or her name doesn’t mean they always have you in mind when they spend your tax dollars. They, in fact, most often exempt themselves from accountability for inclusion in the laws they write no matter what affiliation they proclaim. Our current president most likely falls into the Independent category. He is attempting to effect changes from the norm. However, the established and entrenched members of Congress, of all dispositions, are fighting him simply because he is not a homogeneous Washingtonian. They would rather scuff the toes of their wingtips kicking the can (National Debt) down the road rather than taking charge and disposing of it. It might be time to replace the whole team with members concerned for future generations. Cloward and Piven strategized to bankrupt the system. DONE! The national debt is currently $19,740,000,000,000. The deficit (that the left claims is cut in half) stands at $590,000,000,000. The true unemployment rate is 37.1%. (The difference between the total number of employable persons of working age and those who actually are working), not the claimed 5.0%. Some young relatives of mine just relocated. They are among the intelligent and lucky few who escaped California. They left their jobs but did not collect unemployment insurance so they were not counted among the unemployed. They have obtained jobs in their new state which are statistically counted for Obama’s legacy purposes. They are the same people who were working and are now working, but counted as new hires. Amazing! Then, we have two individuals filling the vacated positions also counted as new hires to bring down the declared unemployment rate. The double count is for the benefit of the uninformed idiot voters who believe the propaganda promulgated by the White House and broadcast on the nightly lies and social media. We have a rampant Marxist government deep in the making and we are on the way to full blown Communism (it takes a village) under a Global Government. This constant agitation of the citizens; the poking and prodding and identifying and dividing population segments are all parts of a strategy. They are not “unintended consequences” that progressives use to excuse themselves after the lights come on. If you want to continue the pattern, by all means vote for Hillary. When everything has been taken from you and your children, perhaps then you’ll awaken. When you find yourself in a food line dependent on the government to give you a chit for sustenance, perhaps you’ll wish you’d stood for the national anthem when there was one. By all means, please share this with everybody you know – conservatives and progressives. The government, the news cycles, the debates all continue to pound us with the fact that we now have $18 trillion in debt. That’s scary. However, what they fail to present is that the United States is suffering under a burden that lies somewhere between $125 trillion to $130 trillion in unfunded liabilities beyond the announced $18 trillion “debt”. The true amount is difficult to accurately identify because it depends on the accounting method used by the government. The method du jour varies according to what they want to present or hide. Hellooo! Unfunded liabilities are debt, too. It is money obligated for contracted purchases of goods, services and programs. It is the government’s credit card spending; obligate the money now and pay for it on time, with interest, hoping that some money will come in to cover it before the next minimum payment comes due. It’s money promised for Welfare, health care, school subsidies, subsidies to state governments, grants and subsidies to foreign governments, etc. Our government has promised, but has not yet figured out how to pay for, over $127,000,000,000,000 in liabilities. This is what is known as a national security threat! 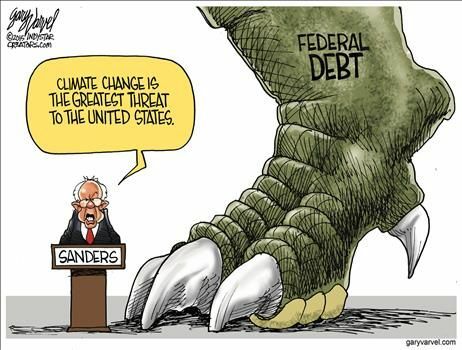 Climate change will not be a concern when the master banker of the world collapses. Unbelievably, a majority of our elected elite are willing to again raise the debt ceiling and continue spending into oblivion. It’s not like the coming chaos is unforeseen. When you have $X coming in and $X+4 being spent and obligated, you’re going to run out of money at some point. The logical way of easing the problem is to cut back on spending. The current way is continue with status quo; blame the previous president and congress but continue spending. Congress after congress, Democrat controlled and Republican controlled, there has not been a budget passed by congress in over ten years. This country has been operating on continuing resolutions with projected escalation since well before Bush left office. Congress continues to appropriate nonexistent funds. This is like your neighbor who knew his continued employment was tenuous, had no savings to fall back on, yet continued his extravagant life paying the minimum on his maxed limit credit cards with what he could borrow from friends. He kept asking for higher limits on his accounts until he could no longer make the minimum payments and his car payment so he lost his car…then his house…then his wife before declaring bankruptcy to relieve his burden. All could have been saved if he just quit buying more unneeded stuff and spending frivolously a couple of years earlier. So, free college for all. Free medical care for all. Free public transportation for all. Free meals for all. Free housing for all. Open the borders and let more people in. No need to work, the government is here for you. They’ll just keep borrowing and spending until our creditors cut us off. Enjoy the ride, it’s all free. IT’S ALL FREE! The Ministry of Truth disseminates the information we need to know and accept to keep the elite in control. “Journalists” aid the office with broadcast and print adaptations of what is happening. Both the Ministry and their tentacle allies advise us not to listen to dissenting opinion or alternate viewpoints which they pursue, distort, demean and destroy wherever possible. According to the Ministry, President Obama is enjoying the highest approval numbers of his second term. Up by 5% over last month according to the latest CNN/ORC survey, it shows that the young and ignorant, gays, socialists and other America haters continue to blindly welcome oppression by edict. He now basks with a 50% approval among the selected respondents. Taking a quick look at the past month, we can clearly see how the rise in popularity came about. 1. While ISIL gained more territory and displayed more violence (including cage drownings and beheading a woman), Obama admitted to the G-7 conference that because he fired all the experienced and knowledgeable military commanders, he is clueless how the murderous thugs might be controlled. Putin is now eyeing the Baltic states as the Ukrain continues to be hammered and Crimea is annexed. The United States is safe…for now. 2. National debt reporting is “frozen” at $18,112,975,000,000. The Treasury Department number has remained the same for the past 15 weeks. The reported number is $25,000,000 under the congressionally approved limit. No matter how much Michelle spends on vacations abroad, this is the number to be reported until congress raises the ceiling. The National Debt Clock records another $118 billion, but you have to seek that number. 3. Great things came to gays with a Supreme Court decision. Christians around the U.S., however, now fear the demise of religious freedom due to the court’s legislative shredding of the Constitution. Only some rights will now be violated. “Congress shall make no law respecting an establishment of religion, or prohibiting the free exercise thereof” has now been replaced by A Supreme Court decision trumps any God given right or restriction on government enumerated by the Founding Fathers. 4. Obamacare wins another round thanks to the court. Once “middle-income” patients now avoid medical attention because they can no longer afford to pay the increased premiums and meet excessive deductions without foregoing mortgage payments, rent, food or such. The ACA is working as designed. 5. Hundreds of unvetted Syrians, Lybians, Sudanese, Guatemalans, El Salvadorans, Hondurans, Chinese, etc. are allowed into the country daily. After receiving a notice to appear before an immigration magistrate, they are released into the general population. Some are briefly detained to receive nourishment, medical attention, monitary stipends, new clothing, etc. before being transported to the state of their choosing. The Ministry reports our border is more secure than it has ever been. 6. The claimed unemployment rate dropped again in June. Officially, it is now 5.3%. The number of able bodied workers who have abdicated responsibility for their personal well being in exchange for government gratuities, however, continues to rise far more rapidly than the official number drops. BLS shows that only 62.6% of the workforce is now active, down 0.3% or 56,000 from just last month. Yes siree, The Ministry of Truth reports all is well and the polls reflect that doctrine.